Nice photograph sent by Jonathan Fogerty of the spinal-cord injury charity Spirit, presenting copies of the Easy On The Eye book to staff at the Oswestry spinal-cord injury Centre. Jonathan has flagged the story up on the Spirit website. Nice to see one of our books ‘in action’ as it were! They will be used by staff and patients at the centre. The book is now being distributed through bookshops and regular online sellers, having been originally mail order only to the medical profession as it were. There are discounts for NHS orders. The image above is from a specialist book we are publishing this month, and shows the testing of the page spreads to make sure they are all correct before it goes to the printer. You only need to get one page wrong and it throws everything else out! The book is on spinal cord injury, and has been written and designed by people with experience of the injury who wanted to see a book out there which helps people cope with the realities of their life changing experience, rather than a well meaning but dry technical guide. 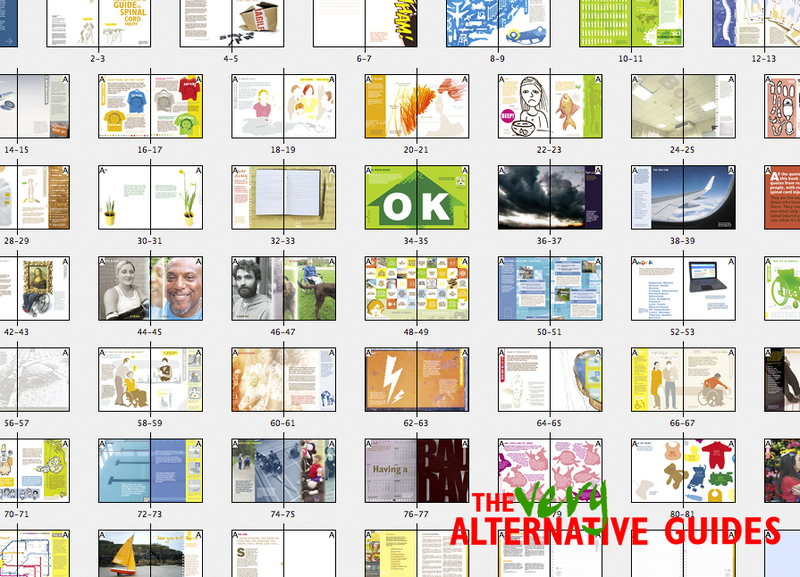 You can read more at the Alternative Guide page which links to their own site.